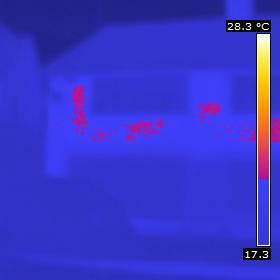 One of the new tools we are using is Thermal imaging cameras to show heat loss and air infiltration. We have all seen the police helicopters on the television chasing suspects that show up as highlighted images hiding behind dustbins and or in woods. How thermal imaging works is it measures the Infa red heat transmitting from an object that the naked eye cannot see. If you imagine holding a lump of hot coal you can feel the heat radiating from it with your other hand or on your face. A thermal image shows this invisible heat as a series of colours in minute degree Variations. Like a digital camera makes up a picture of millions of individual dots the thermal image is the same with each dot having a colour. The camera and software then has some clever features where we can change the colour palates to enable the best analysis of what we are looking at. The Police helicopter just needs to see individuals as example so uses black and white. With buildings we need more finely adjusted images so we use a range of colour palates that high light what we are looking at in more detail. The cameras also have sophisticated features where we can set individual internal and external temperatures and then highlight missing areas of insulation or areas subject to mould. The saying a picture is worth a thousand words could have been written for a thermal image of heat leaking from a house. While we can show defective areas of properties or areas that need improvement we can also use the camera for a quality control role and inspect new buildings are built to the required standards. While thermal imaging will show heat escaping from a property once indoors it will also show where cold air is entering the building. Being non invasive no damage is caused and you have a clear picture of each wall or defective area which in many cases can be little more than needing some sealer to rectify. In many instances the cold air particularly around skirting and ducting is absorbed by the carpet, so you don’t feel any direct draughts. You would imagine a newly built house would be sealed very well new houses also have a air permeability test where a negative pressure is created by fitting a large fan in a doorway then measuring the results. To pass the current building regulations a new property has to be 10 PA or below. Currently architects are building low carbon homes which are as low as 1PA, with Passive house standards being even lower. When I was recently asked to do a thermal imaging survey on a new property 5 years old (with air permeability on 9) you would expect it to be a pretty air tight building. The results were a complete shock for the home owner and you could say resulted in the equivalent of leaving a window open, 24 hours a day. The external images showed all the areas of insulation were in place as you would expect but internal the house leaked like a sieve. This not only has the effect of cooling the house when you are in it but is working against you 24 hours a day. If you imagine we set our heating to come on at 6am it rises to say 21 degrees which we have set it to. At 8.30 when we leave to go to work it goes off say till 4 pm when we come home in the evening. All the time in between cold air is entering the property meaning the boiler has to work harder at 4pm to get back up to the 21 degrees. 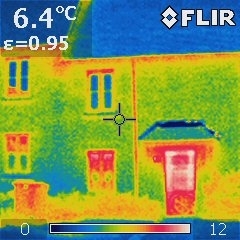 Until recently Thermal imaging cameras cost in the region of £30 thousand pounds which put them completely out of reach of surveyors and property professionals over the last couple of years they have become more affordable and surveyors and Architects are starting to see there benefits for a vast array of defects and problems as well as energy efficiency. As heating bills continually rise and thermal imaging becomes more known to the general public home owners will start to see where they can make low cost improvements to improve there comfort and save on fuel bills. The next article I will show the results of a relatively new house and try to explain why there are so still so many draught problems. « What is the Green Deal Scheme?